Prime Rib is a very traditional cut. A full seven ribs may weigh between eighteen to twenty pounds when fully trimmed. Each rib will feed approximately 2 to 3 people. Prime Rib has a beautiful presentation, it’s big, it has bones and it has fat… everything I love!! Beef Tenderloin on the other hand has no bones, and very little fat. It’s very tender, but you need to season it well. Beef tenderloin is relatively easy to prepare, cooks up pretty quickly compared to other beef roasts. Fully trimmed tenderloin will weigh four to five pounds. Top Sirloin boasts a nice beefy flavor. It’s less expensive than some of the other beef roasts. Top Sirloin is relatively lean, but will still be tender and juicy as long as you don’t over cook it. N.Y. Strip Roast, yes… most people think of N.Y. Strip only as a steak, but let me tell you, it makes for one fantastic roast! Not as fatty as Prime Rib, but still packed with flavor. Crown Roast is one of my favorites to make at Christmas; it has one of the loveliest presentations. Crown roast of pork will weigh between 8 to 10 pounds, and have about 18 ribs. I suggest 1 to 1 ½ ribs per person. You can even stuff the middle of the Crown for something extra special! Rack of Pork is basically one half of the Crown Roast, about 8 to 10 ribs. Still have a nice presentation, and the same serving size. Both Crown, and Rack come from the same rib section of the pork loin. The Rack is straight, not bent around like the Crown. Boneless Pork Loin is one of those roasts that you can do so much with. You can simply season it and roast it whole, and serve it with a gravy or sauce. Or, have your butcher butterfly it open and stuff it with an array of fruits, nuts, or fresh herbs. A few of my favorites include; apple and cranberry, sausage and apple, apple and walnuts, or apricots. 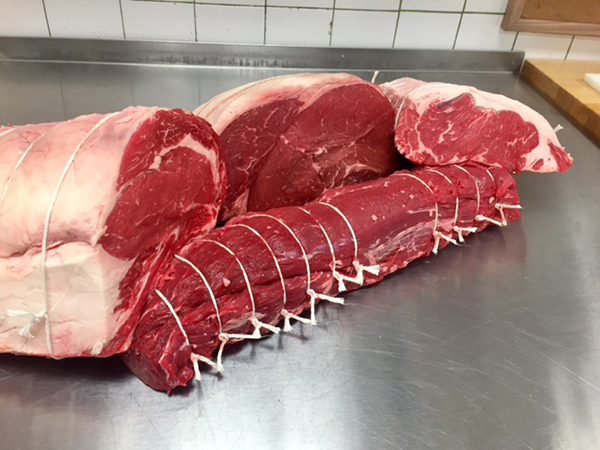 Ask your butcher to give you some twine to tie up your stuffed roast, and to leave a layer of fat on it! Pork Rib Roast comes from the rib end of the pork loin, just next to the shoulder. It will only weigh about 4 to 5 pounds, so it’s perfect for a smaller crowd, or an addition to another meat item. Leg of Lamb absolutely makes my list. We prepare the leg in two different ways; Semi-boneless, where we remove the hipbone and the shank, and boneless. The boneless can be butterflied open to be stuffed with fresh herbs or spices, also can be laid flat for grilling. You will need about ¾ of a pound per person with a semi leg, and about ½ pound boneless. Crown Roast of Lamb really has an impressive appearance on your holiday dinner table. 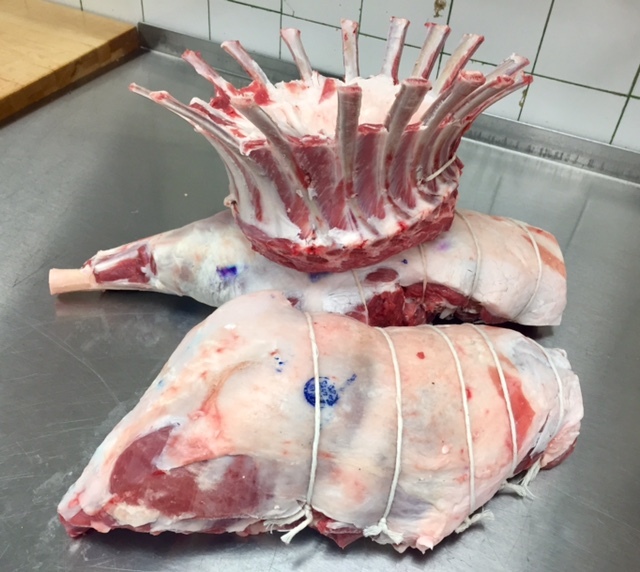 Lamb Crowns are perfect for that smaller intimate dinner, serving about six guests. Turkey is a holiday favorite. The bird can be made in many different ways, and can satisfy small to large dinners. Turkey is a good complement to another meat being served. Goose is a European favorite for Christmas dinner. In fact, in Germany it’s a staple on the holiday table. 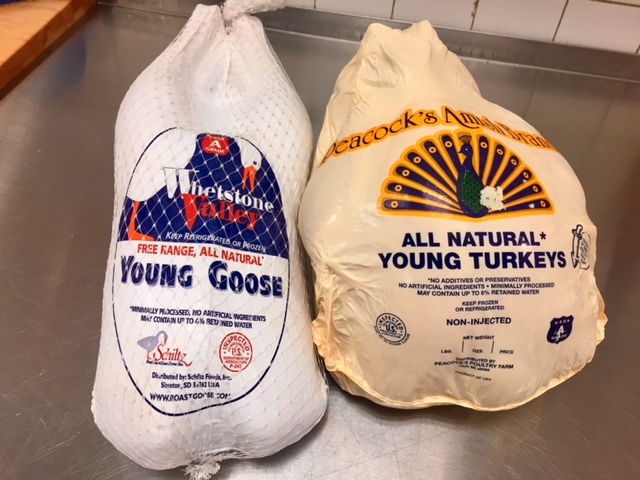 The geese today are farm raised, and have dark and flavorful meat. The average size of a goose is 8 to 12 pounds. Merry Christmas, and happy grilling!! !